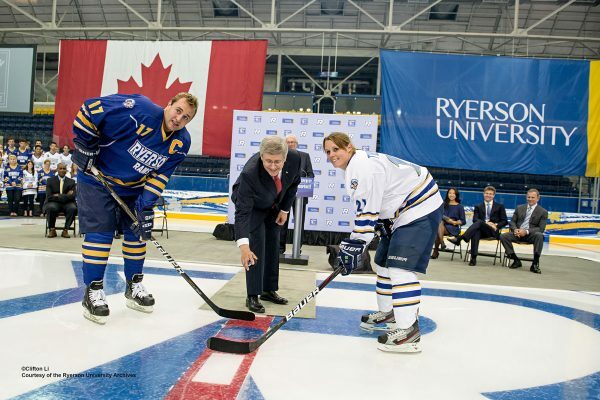 This year marks a special Anniversary at Ryerson University – a double anniversary. 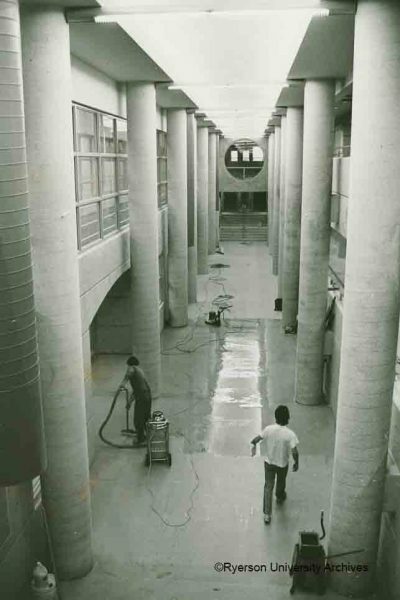 It has been 70 years since the founding of the school and 25 years since it achieved University status. 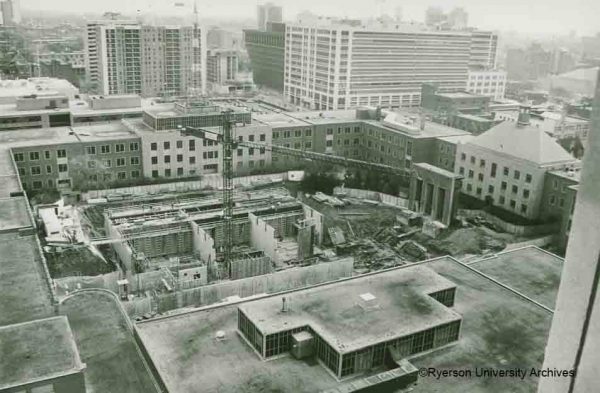 In conjunction with University wide celebrations, The Ryerson University and Archives has created an exhibit, running June 1 – October 31, looking back at the history of the school. 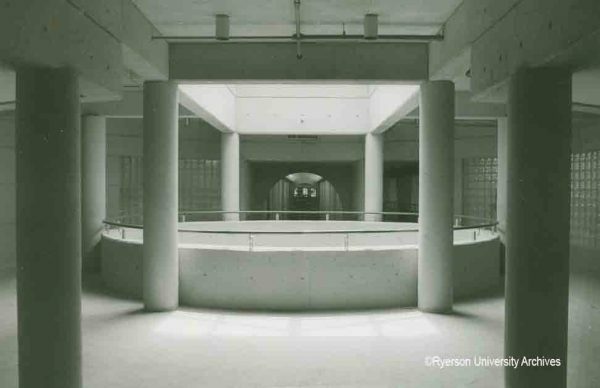 For each month the exhibit is open we will feature in our blog one of the 5 themes of the exhibit: 5 pivotal moments in Ryerson’s history, Student Groups and Clubs, Student Government, Student Housing, and Athletics and Intramurals. 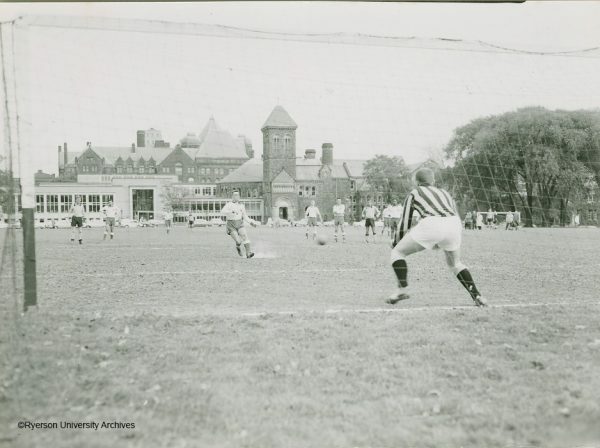 For October’s blog and the final installment in our special anniversary series we will look at Athletics and Intramurals – the spaces and the evolution of inter-university sport and intramurals between 1948 and 1993. 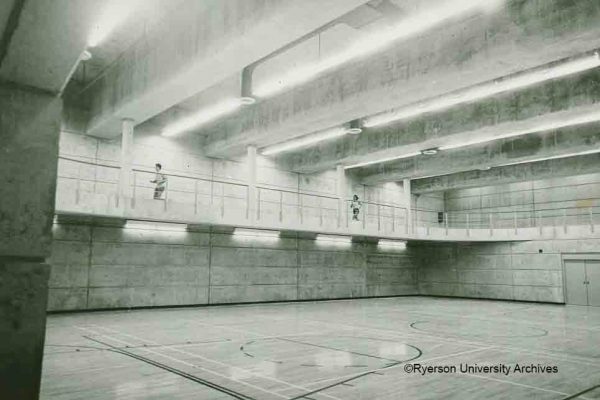 In 1950 Ryerson’s first gymnasium was located in a converted garage on Church Street. The space consisted of a spacious gymnasium with lockers and shower facilities, a social/common room, The Supply Store, a game room, a tuck shop, and a barber shop. 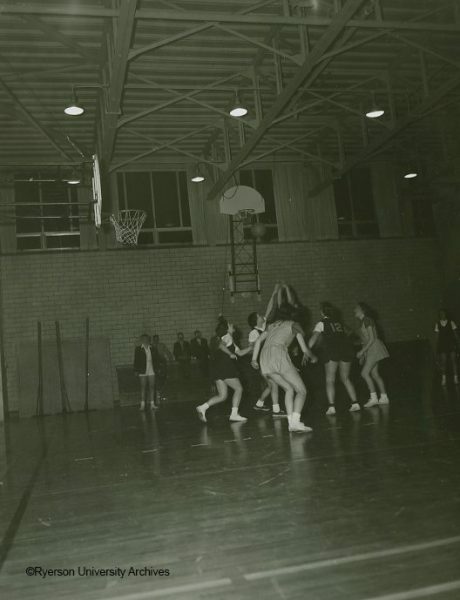 In the 1964 2 new gymnasiums and a swimming pool opened in the brand new Howard Kerr Hall. 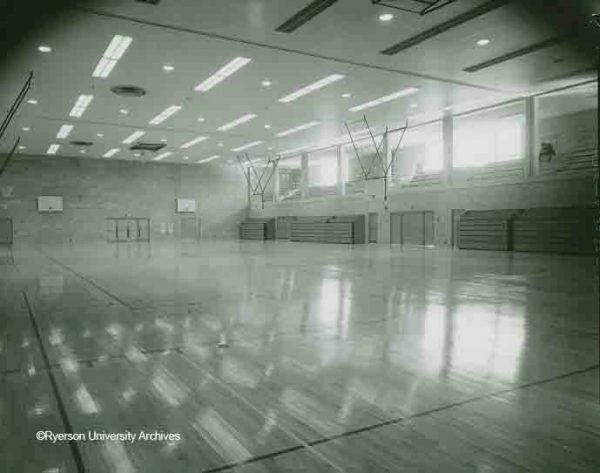 The two gymnasiums could be utilized as 3 full sized basketball courts, 9 badminton courts, or 6 volleyball courts. The 23 metre swimming pool was built with 2 one-metre diving boards and a locker room. 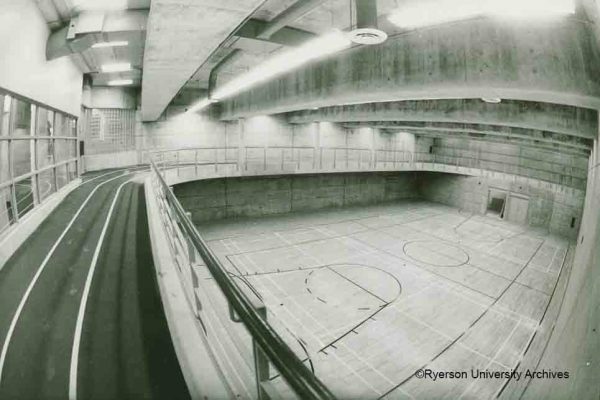 Opened in 1987, Ryerson’s unique underground Recreation and Athletics Centre provided 50,000 square feet of new facilities including 7 squash courts, two multipurpose gyms, a fitness training centre, a dance studio, a running track, and shower facilities. 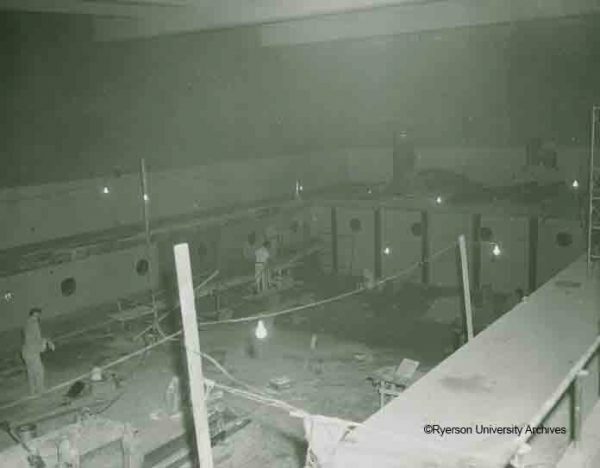 Built beneath the Kerr Hall Quadrangle, the two storey centre required a 30 foot excavation to accommodate it. The Mattamy Athletic Centre, previously known as Maple Leaf Gardens, features a second floor fitness centre and a hardwood dance studio. 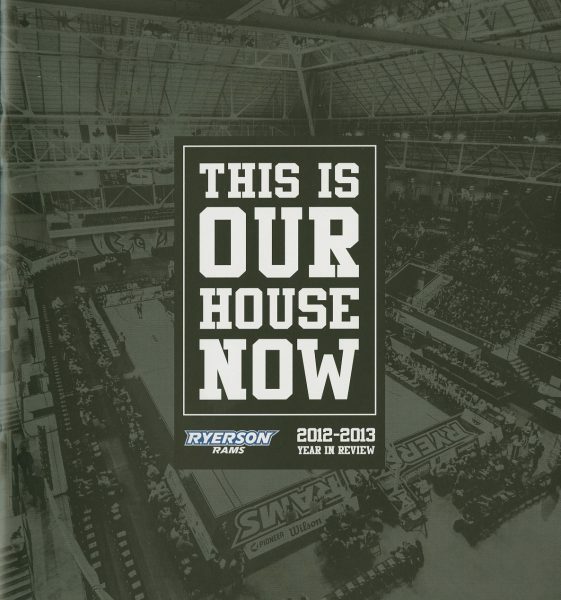 Home of the Ryerson Rams basketball, volleyball, and hockey teams since 2012, the building also houses a full sized ice rink that can accommodate 2500 seated fans, team rooms, and Coca-Cola Court – a multipurpose gym court. 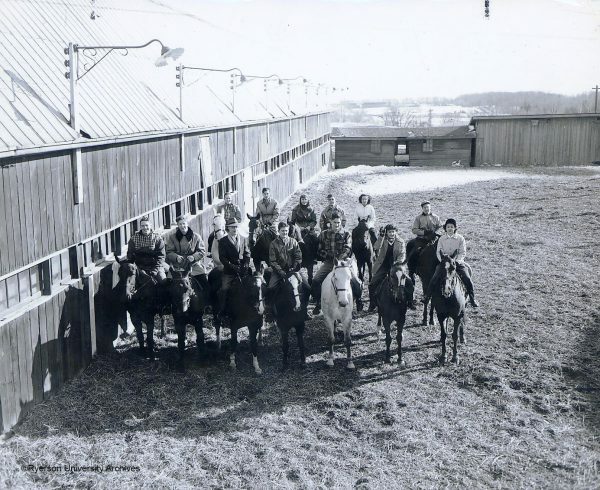 The first sports teams organized at Ryerson in 1948 were men’s hockey, men’s basketball and co-ed swimming, and co-ed equestrian. The men’s hockey team was the first athletics group to compete wearing the blue, gold, and white uniform. 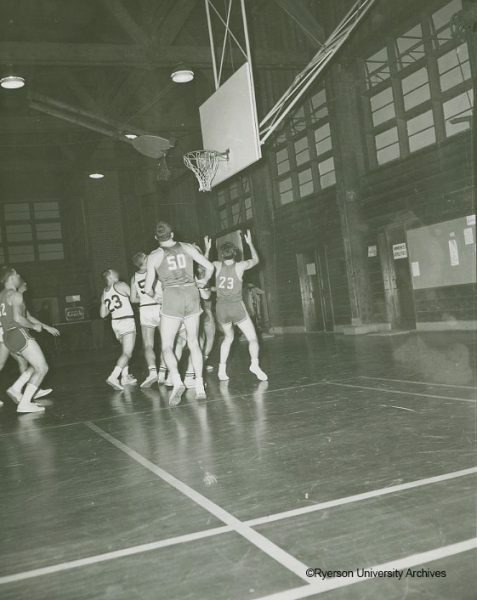 In 1949 a women’s hockey team was established and played at Ravina Gardens in High Park. 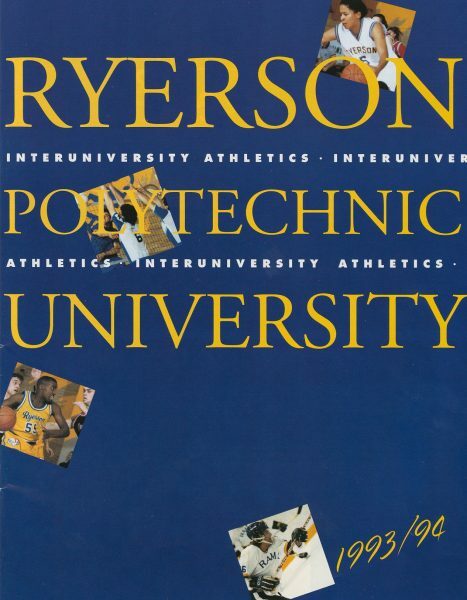 By 1993, Ryerson Athletics programs were much more developed. The teams competed nationally in the Canadian Inter-university Athletic Union in hockey, basketball, volleyball, soccer and swimming. 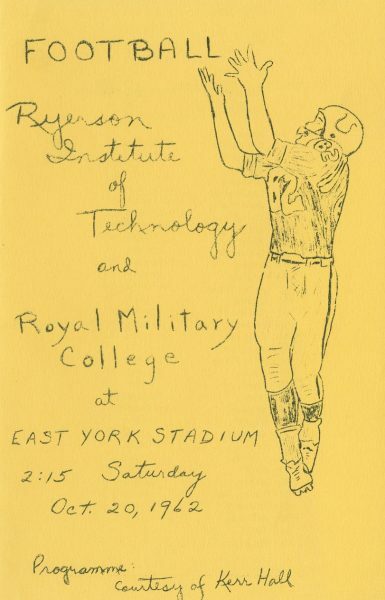 Other Ryerson sports teams included badminton, fencing, squash, as well as men’s hockey and women’s figure skating. 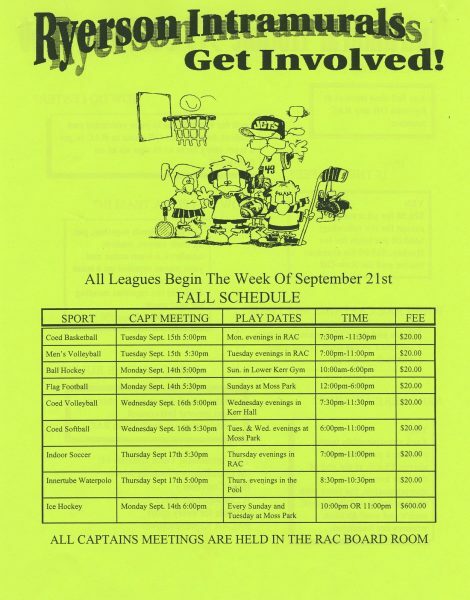 Intramural programs were designed with fun and creation in mind. 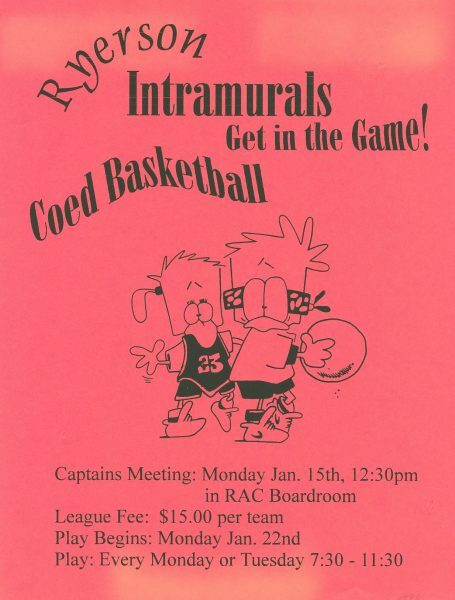 There were no try-outs or skill requirements to join. 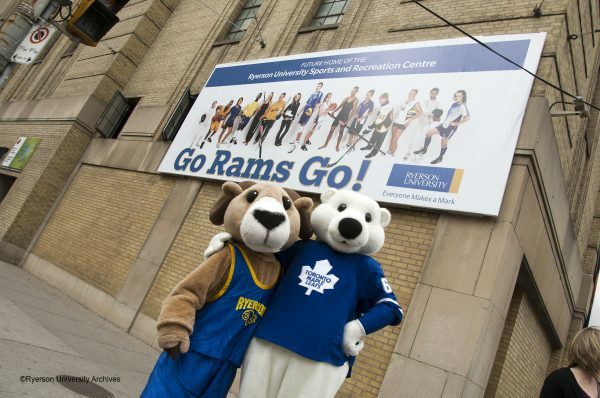 Because of a delay in the construction of Ryerson’s gymnasium on Church Street, the Athletics Association was not able to organize extensive intramural programs. 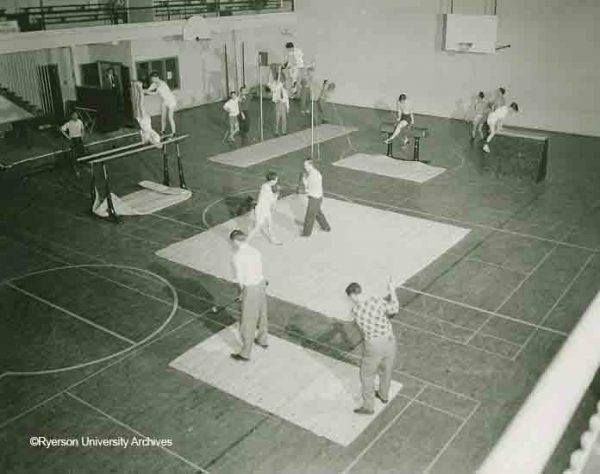 By the Fall of 1951 intramural programs for basketball, badminton and volleyball were held in the gym, while hockey, swimming, riding, curling and skiing took place off campus. 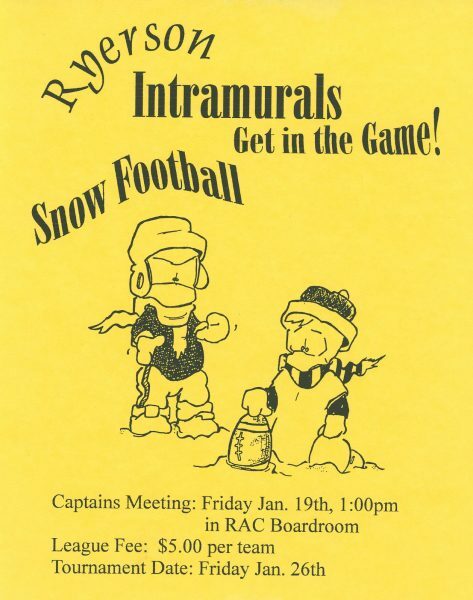 By 1993 over 3000 students participated in 40 different intramural programs. 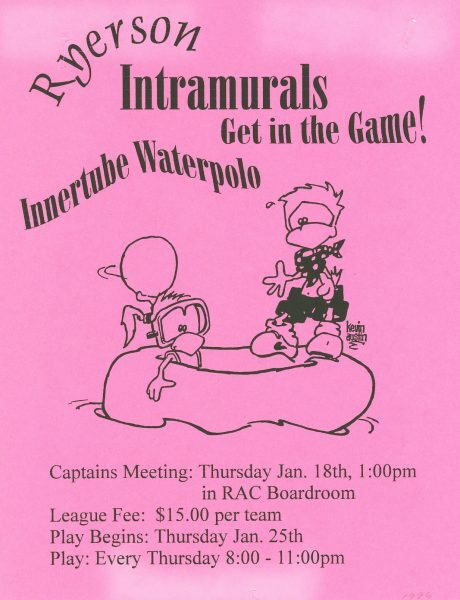 Leagues were divided into women’s, co-ed, and men’s groups and programs included aerobics, innertube water polo and line dancing. 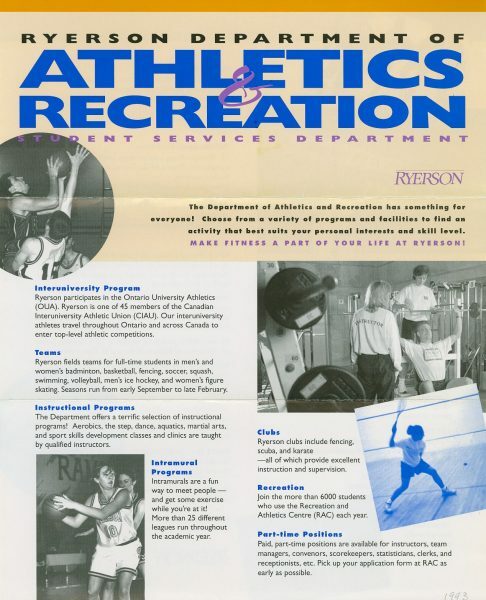 To learn more about Athletics and Intramurals at Ryerson – please visit the Ryerson University Archives and Special Collections located on the 4th floor of the library in Room LIB404. This entry was posted in Uncategorized by Rosalynn. Bookmark the permalink.